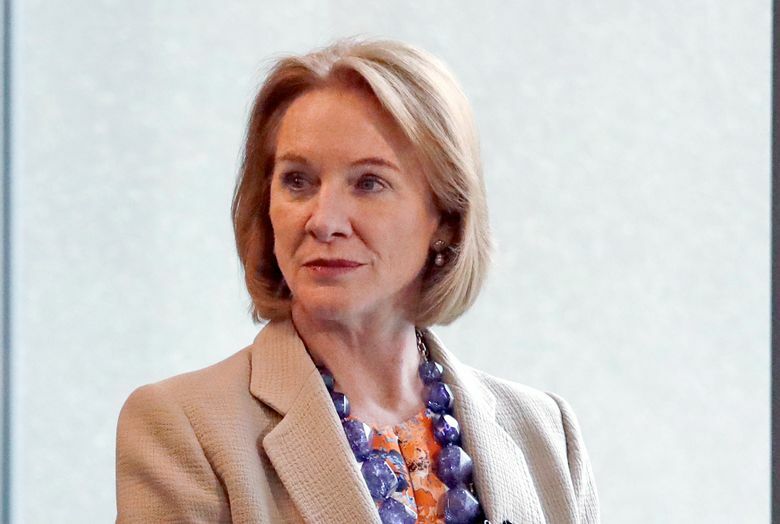 Seattle Mayor Jenny Durkan promised “no more talk” before her election and referred to herself as “the impatient mayor” last month. We look at what she’s achieved and where she’s fallen short in her first 100 days in office. In her first 100 days as Seattle mayor, Jenny Durkan — who promised “no more talk” before her election and referred to herself as “the impatient mayor” last month — has taken swift action on emerging issues, begun to make good on some campaign vows and started to slip behind on others. Notably, Durkan has moved to expand a free-college program while readjusting some of her ambitious goals on homelessness. She was even more specific on her campaign website, vowing to provide vouchers to 350 households on the Seattle Housing Authority (SHA) waiting list in her second week as mayor. That didn’t happen right away. Instead, she directed a team to contact those households and try to save them money by expediting their enrollment in other public-benefit programs, such as a city program that offers discounts on utility payments. Of 149 people contacted, 32 were potential new enrollees in the utility-discount program, according to the mayor’s office. Durkan did win City Council approval last month to use $2 million from the sale of a South Lake Union property to fund a rental-assistance pilot program. Scheduled to begin in April, the pilot will serve only 150 households, rather than 350. Durkan is now targeting a slightly different population on the SHA Section 8 waiting list, said Stephanie Formas, a spokeswoman. “When you’re outside government, your information isn’t perfect,” Durkan said, saying it’s taking more time than she anticipated to identify whom to help and how. The mayor’s commitment to open 700 shelter beds was made with no particular deadline, Formas said. On her campaign website, Durkan wrote, “I will lead an effort to create 50 to 100 additional beds in each City Council district,” suggesting the beds could be provided by opening community centers during nonoperating hours. None of those beds has been created to date, Formas said. The day before Durkan took office in November, the city completed a new contracting process for homeless-services providers that shifted millions of dollars away from traditional shelter beds to 24-hour “enhanced” shelters, with more services. To prevent traditional shelters from closing during the winter as a result of the new contracting process, Durkan in December announced $1 million in bridge funding. The mayor said she remains committed to the 1,000-unit goal for tiny houses, and the council approved a Durkan plan to use more than $5 million from the South Lake Union property sale for a range of shelter and housing options. But Durkan is now talking about possibly reaching her 1,000 units with tents, modular bunkhouses, backyard cottages and leased apartments in addition to tiny houses — and she’s suggesting some of the units could be located outside the city. Thus far, the new administration has announced one new tiny-house village, which will shelter up to 20 women in Whittier Heights. Scheduled to open in May, the village was in the works many months before Durkan took office. Durkan set her herself apart from her rivals last year by disagreeing with their calls for Seattle to stop clearing unauthorized encampments — and she has continued the removals, which she says are necessary when encampments become dangerous. The city must offer shelter beds to people in the encampments before removing the sites. But the best shelters are packed, so removals have slowed in recent months. “The sweeps have been one of the most disappointing and really abusive aspects of her administration,” said Jesse Hagopian, a high-school teacher and education activist who supported Seattle Peoples Party candidate Nikkita Oliver in last year’s race. 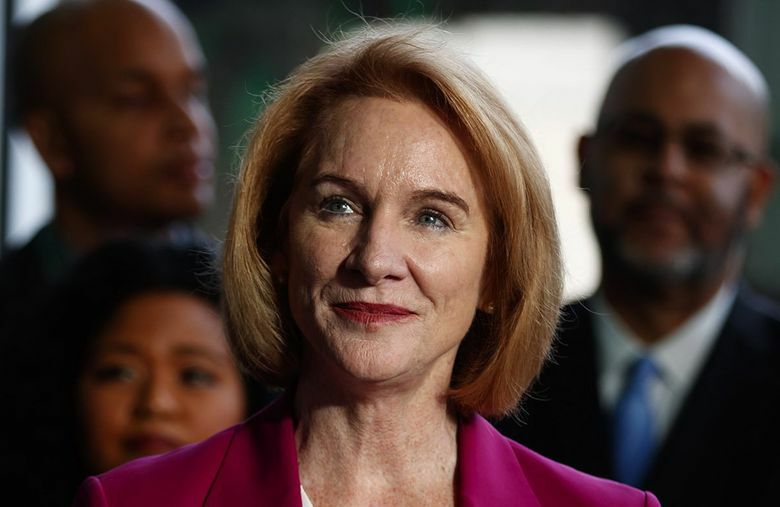 Another headline promise Durkan made during her campaign was free community college, and the mayor has taken key steps to create a program that will eventually offer two-year scholarships to graduates from every public high school in the city. Building on an existing program, she signed a key partnership agreement Wednesday with Seattle Colleges and Seattle Public Schools leaders. Her timeline has slipped. Graduates from every school will be eligible starting in fall 2019, rather than fall 2018, like Durkan said on her campaign website. Still, Durkan said leaders elsewhere in Washington now are showing interest in the concept. Backed by most of Seattle’s business and labor power brokers last year, Durkan has also moved on issues related to transit, criminal justice, business and sports. The mayor announced a plan to offer ORCA passes to all the city’s public high-school students by fall 2018. She convened a Small Business Advisory Council, which met for the first time Feb. 21. And she joined City Attorney Pete Holmes to say Seattle would vacate hundreds of misdemeanor marijuana convictions. Durkan even met with the National Hockey League to discuss a Los Angeles-based sports and entertainment group’s plans to bring a team to a renovated KeyArena. “I like the general direction of Mayor Durkan’s first 100 days,” said Julie Pham, who leads the Washington Technology Industry Association’s civic-collaboration program. The Northwest Vietnamese News co-owner, who supported Durkan’s campaign last year, singled out the free-college plan as a highlight of the mayor’s early moves. “Employers need a well-trained workforce,” and the college program will allow “as many people as possible to get those jobs,” Pham said. In addition to campaign vows, emerging issues have spurred action. Taking office as the #MeToo movement gained momentum, Durkan called for a comprehensive review of the city’s harassment and discrimination policies. After outrage over the state Department of Licensing’s releasing personal information to federal immigration authorities, she ordered the city’s department directors to refer all immigration-related requests to her office. And responding to the shooting at a Florida high school that claimed 17 lives last month, Durkan has scheduled a town-hall meeting Thursday with local students. But the new mayor’s thorniest challenges are yet to come. After Seattle’s parks superintendent stepped down, Durkan waved goodbye to the leaders of the city’s electric utility and departments of human-resources, police, transportation and information-technology. Those are important jobs, and voters will scrutinize the mayor’s nominees in trying to understand where she intends to take her administration over the next four years. Pham said Durkan seems to be making thoughtful changes, while Hagopian said he plans to monitor how Durkan handles matters related to Charleena Lyles, an African-American mother fatally shot by police in her Magnuson Park home last year. More than the mayor, ordinary people fighting for change in Seattle will decide what happens next in the city, Hagopian added, saying advocacy by Rainier Beach High School students and by Oliver paved the way for Durkan’s ORCA card plan. “I think the progress being made under her administration is really the result of grass-roots social movements,” he said. Durkan said she’s been collecting ideas by visiting overlooked communities and spending time with city employees. “From kids to seniors, everybody wants this city to be a better city, and I think that’s the most fundamental thing,” she said.